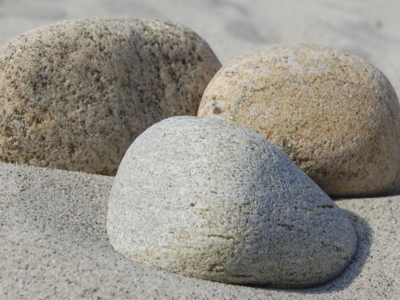 Rocks and sand are the composites of a good portfolio. Good portfolios have low expense ratios and minimal trading costs. Trading costs are the costs of buying a security. Depending on the brokerage house, the cost of a trade averages between $10 and $20. Expense ratios are the percentage of assets used to run a mutual fund, the overhead. We use a technique that keeps each of them as low as possible. Keeping expenses low keeps returns high. As an example, consider the difference between investing in a typical foreign mutual fund with an expense ratio of about 1.35% verses an exchange traded fund (ETF) with an expense ratios are about .35%. The 1% spread in expenses does not mean one should not own foreign stock mutual funds, but it does mean you or your advisor should have a good knowledge of the global markets before diversifying your portfolio to include them. The advantage of the mutual fund is that they have no transaction fee to buy or sell them. This allows you to rebalance your portfolio as market conditions change without incurring a fee to do so. Unlike a mutual fund that that is only traded at the next close of market price, ETFs are sold throughout the day on the stock exchange exactly like a stock. And also like a stock, they have a brokerage charge to buy or sell them, typically in the $10 to $20 range at a discount broker. For small investment amounts the transaction charge would represent too large a percentage of the investment. As a general rule, the transaction cost to purchase an investment should not exceed 1% of the amount being invested. We would consider paying more than $10 to purchase $1,000 worth of a security too much. The “Rocks and Sand” technique comes from the following analogy: Imaging you have several buckets that represent different asset classes you want to invest in. (We use 6.) Purchasing large rocks costs money (transaction cost), but they have a lower expense ratio after you have purchased them. Since rocks cost money to be broken up, they aren’t as cost efficient when you need to move funds from one bucket to another. Buckets can be filled in with sand with a higher expense ratio, but it doesn’t cost any money to move sand from one bucket to another. The transaction cost of building a portfolio of ETF “Rocks” is more than compensated by the fact that ETFs have lower expense ratios. IShares MSCI EAFE (EFA) is the most popular ETF for foreign stock investing. Its expense ratio is only 0.35%, an entire percentage less than the typical foreign stock funds. Lower expense ratios are saved every year, while transaction costs are only incurred in the year the investment is purchased or sold. Therefore, $100,000 invested in a foreign ETF with a lower expense ratio will grow to $336,083 at 12% over ten years verses only $304,415 if invested in a typical foreign stock mutual fund with a higher expense ratio. The additional $31,668 represents a 10.4% higher gain as a result of the compounded difference from the reduced expense ratio. To reap the benefits of monthly additional investments and lower expense ratios, we use a combination of ETFs and no-transaction fee mutual funds. We invest large amounts in ETF shares that provide the rough asset allocation “Rocks” we are seeking to save on expense costs. These positions aren’t bought and sold to take advantage of lower expense ratios without incurring transaction costs. Smaller monthly amounts are invested in no-transaction fee no-load mutual funds on a regular basis, like “sand” filling in around the “Rocks”. These funds have slightly higher expense ratios, but the amounts are small compared to ETFs, so the overall portfolio expenses remain small. Then, when a significant amount of “sand” dollars collect in the mutual fund of one asset class, that fund is sold and a lower expenses ratio ETF “Rock” is purchased in its place. Conversely, if an asset class needs to be reduced, some of the ETF is sold and the smaller portion of the proceeds is reinvested in a similar mutual fund. The lowest cost method for keeping an asset allocation model balanced is to buy mostly rocks for each of the buckets of a diversified portfolio, and then add the sand of a no-transaction-fee mutual fund into the bucket that needs rebalancing. Whenever too much sand has accumulated in one of our 6 buckets, we sell the sand and replace it with another rock. If the weight of the rock(s) in one bucket gets to be too much, we sell a piece of rock and replace it with some sand which can be easily moved into one of the other buckets. This “Rocks and sand” technique can enhance your portfolio returns by as much as a full percent each year. This is especially true for portfolios between $500,000 and one million dollars. There are even more powerful techniques that can be used for amounts in excess of one million dollars. For large accounts, engaging a Fee-Only financial planner often pays for itself in lower expense ratios alone.